"We were initially impressed with Beata Matko's enthusiasm, professional demeanor, and motivational techniques when she started Conductive Education with our then six year old son. She is very knowledgeable in the ways of Conductive Ed and has found ways to motivate him to try to improve. With every case of cerebral palsy being different, a cookie cutter approach will not work. Miss Beata tailored the routine specific to Ezra's needs and he is responding. More so she makes the session comfortable for the child and he actually looks forward to working with her. We have been working with him at home ourselves for sometime and he was starting to complain and fight the routine on a regular basis. He simply was not wanting to do the excercises. The day he started with Miss Beata, he started trying and working hard again. The fact that he is motivated and progressing is directly related to her interaction with him. While he has only been working with miss Beata for five weeks, he is now determined to only use his canes in the house. We have been trying to push this action for six months now. We were happy and lucky to have found her and her knowledgeable approach and look forward to her working with him long into the future. Beata Matko has my full recommendation, and I am happy to furnish more details if needed." "Beata has been working with my son since 2013. She is a warm hearted woman that clearly loves what she does. She is so professional and can find the perfect balance between love and exercise. When we started, my son could only roll over but today, after three years, he is sitting with no support, commando crawling, crawling on all fours in a perfect way, learned to transfer himself from different positions, learned how to walk with a key walker, and so much more. She knows exactly how to create the perfect work plan specially for his needs. 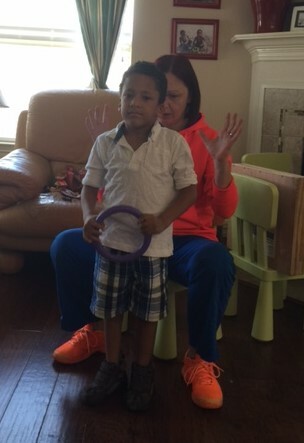 Thanks to her, my son gained a lot of independence when other conventional therapists gave up on him. My son loves her and can't wait for their daily sessions. One of the reasons that I really like to work with her is because she is very creative and can come up with a solution to every problem that might be presented to her. She knows how to make my son work and she knows how to make him happy. Beata, We love you and thank you for everything that you are doing for us!"